Yucatan is definitely a place to visit and there are some beautiful places to see. The best thing would be to explore the ruins and sights of Yucatan first and maybe add a relaxing stay on the white sand beaches of Playacar later because all the sight seeing can be quite exhausting. Another advise would be to pay for tours when you're in Mexico instead of booking an all inclusive trip back home because prices are much lower there and you will probably see more places. As in what to bring, just pack your thinnest summer clothin because it gets really hot and there is a high humidity percentage. The food is superb and most of the hotels in Playacar have an all inclusive policy where you will be able to eat as much as you like, alcoholic drinks included. Playacar is a resort area of Playa del Carmen, south of Cancun. 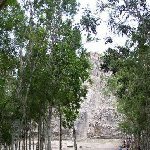 The touring guides were always very friendly and helpful and helped creating a great atmosphere which is imported as you'll pass several hours on a bus touring Yucatan. They also helped us out bargaining for souvenirs which was great! Things to look out for, definitely the many mosquitos so bring some insect repellent and while you're at it, enough drinking water as you will be walking a lot and the weather can be hot. When it rains, the showers are quite impressive but don't last long and are a typical example of any other tropical destination. You might even witness a cyclone passing by but let's hope you won't have that much luck..
Driving around Yucatan we visited some amazing Maya temples and especially the El Castillo temple-pyramid of Chichen Itza is mind blowing. Just be careful coming down the stairs of Chichen Itza as they can be quite steep even if you can hold on to a rope. Don't forget to ask your guide if you can entre the temple! Once you're on top of the Chichen Itza pyramid the view is amazing and definitely worth the climb. Some of the other pyramids weren't in such good conditions as El Castillo and requested a bit more patience. 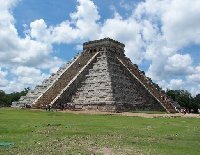 Did you enjoy The Maya temple pyramids in Yucatan and have you been on a holiday in Yucatan, Mexico?